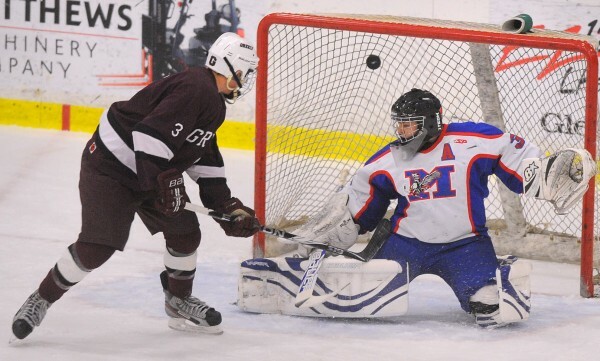 Greely High School's Ben Hackett (left) puts the puck in the net past Messalonskee High School's goalie Nathan DelGiudice. Hackett scored the team's second goal during the first period of the State Class B Championship game. Greely won the game 6-2. 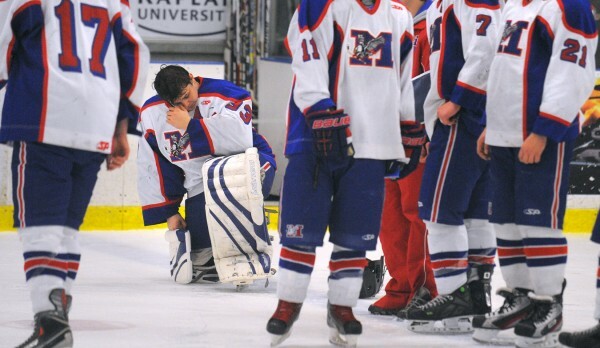 Messalonskee High School's goalie Nathan DelGiudice waits dejected as the team gets the runner-up medals after losing the State Class B Championship game. Greely won the game 6-2. 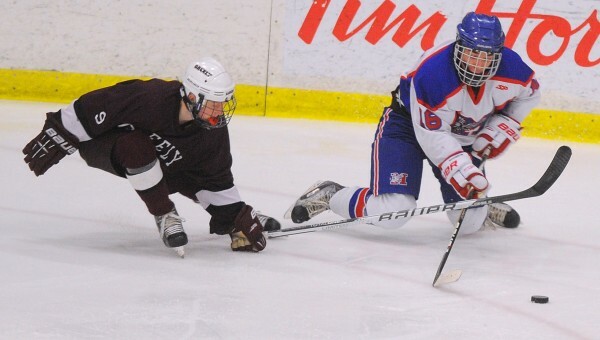 Greely High School's Reid Howland (left) and Messalonskee High School's James Varney battle for the puck during the second period of the State Class B Championship game. Greely won the game 6-2. LEWISTON — It was a case of sudden impact at the Androscoggin Bank Colisee on Saturday, as Greely of Cumberland Center scored three goals within a 62-second span of the first period and went on to a 6-2 victory over Messalonskee of Oakland to win its second Class B hockey state championship in four years. Senior Peter Stauber and sophomore Ted Hart each scored twice as Greely returned to state championship form for the first time since 2009. Ben Hackett added a goal and two assists and Pete Hurley also scored for the 15-4-2 Rangers, while freshman goalie Kyle Kramlich made 14 saves to offset a high-quality 29-save effort by Messalonskee senior Nate DelGiudice. Messalonskee completed its best season in program history with an 18-4 record. Greely took a 1-0 lead on a shorthanded goal 11:56 into the match when Stauber stole a pass near the blue line, sped past Messalonskee defenseman Travis St. Pierre down the right wing and beat DelGiudice with a low shot inside the far post — with just one second left in Messalonskee’s first power play. “I just tried to get outside and beat the defender and then go low on the goalie,” said Stauber. “That’s what we talked about all season about going against their goalie and that’s what I did,” said Stauber. It took the Rangers just 50 seconds to double their lead as Hackett tipped a shot by Mitchel Donovan from the right wing under the crossbar to make it 2-0 at 12:46. Messalonskee was still reeling from that goal when Hackett gained possession in the left corner and passed it closer to the net to Hart, who stuffed the puck inside the near post 12 seconds after the ensuring faceoff to give Greely a three-goal cushion. Messalonskee finally sustained some offense during its second power play, with St. Pierre getting Messalonskee on the scoreboard at 9:22 of the second period. Defenseman Dominic Dexter began the play with a short pass from along the right boards back to Jake Dexter at the point, and he passed the puck across the ice to St. Pierre, whose shot from the left point glanced off Kramlich’s right arm and into the net. Sam Dexter and Jake Dexter each had a breakaway chance later in the period to draw the Eagles even closer, Sam with a shorthanded bid that got away from him just as he reached Kramlich, and Jake with a blast that caromed high off the right goal post. DelGiudice kept it a two-goal game through the end of the period with several challenging glove saves to thwart the Rangers, who held a 22-9 advantage in shots at the second intermission. Greely ultimately took a 4-1 at 11:32 of the final period when Hart gained control of the puck at center ice, carried it into the offensive end and shot wide right of DelGiudice. Hackett gathered the puck behind the net and flipped a backhand pass behind him to Hart near the right post for a quick redirection into the near corner of the net. Stauber made it 5-1 with an empty-net goal at 13:37 before Sam Dexter broke through for his 48th goal of the season off a Billy Blake assist 18 seconds later. Hurley added an empty-net goal with 15 seconds remaining.